As a "pick-me-up" comfort for some dark and very misty November days I decided to bake some scones with pecan nuts and maple syrup using this recipe on scones with maple syrup and walnuts as starting point. I decided to use pecan nuts as I have plenty of those nuts from a recent trip to US, however you can easily replace pecan nuts with either walnuts or hazel nuts in my opinion. After the cutting of the scones, I let the scones raise for 15-20 minutes, before glazing them with egg wash. 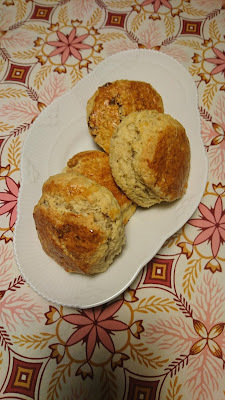 It is important only to glaze the top of the scones, so they can continue to raise during the baking step. The raising before the baking could also be 30-40 minutes, it depends on the amount you have available in your kitchen. The salty taste is a little to high for me, so I would recommend to lower the salt addition from 1 teaspoon to ½ teaspoon. Mix milk and maple syrup together. Place the dough on a piece of baking paper. Flatten the dough by hand into a height of 3 cm. Cut out 12-16 scones, I use a glass for this purpose. Place the scones on a baking tray covered with baking paper. Let the scone raise for 15-40 minutes before baking. Glaze the top of the scones with egg wash using a brush. Cool down the scones before serving them with clotted cream & jam or lemon curd.